Sometimes scribbling the thing (or person or pet) that has the most meaning to you is the hardest drawing task of all! I know it is for me. Since I confessed last week--twice--that I want to learn to sketch my dogs but I struggle to produce anything that even resembles a dog, I thought I should get the courage to show you what I mean. I drew this messy page sitting on the floor watching my recent foster puppy eat her breakfast. The pup has been gone, off to her permanent home for a little over a week now and I have to say, I am so glad I drew this page! And I'm so glad I kept it in the sketchbook (I have a rule--never tear a page out). You can see that when I did the page I wrote my curiosity about whether or not that mess would become a page I would like later--and the answer is yes!! Mind you, I'm not saying I like the sketches as art. Sheesh--I can NOT draw a dog. 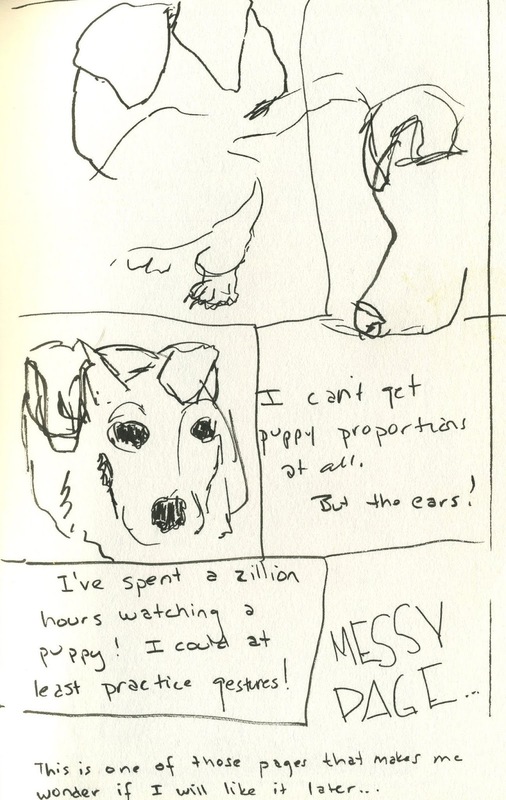 But I am glad I did these drawings, because looking at the page now, I can feel the energy and happiness of that spritely little pup. It brings back the memories--just the way I know a travel journal can do. Of course, all of life is a journey. We're all travelers here, aren't we? So I guess it makes sense that pretty much anything we sketch is part of a big "life travels" travel journal in a way. So there you have it. Scribble and don't worry about the results. Don't throw the results away, even if you think they are laughable! The meaning of the experience still reverberates in the thing you created. And that makes it very valuable indeed!